Haruo Nakajima, who wore the Godzilla bodysuit for every Godzilla film from the original to 1972’s Godzilla vs. Gigan, has died aged 88, according to US reports. Nakajima’s career began in samurai and war films, notably Seven Samurai by Akira Kurosawa and Eagle of the Pacific. He landed the Godzilla role starting with 1954’s Godzilla, King of the Monsters, directed by Ishiro Honda. 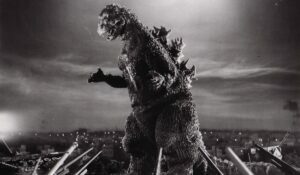 In an April interview, Nakajima explained how the original 1954 Godzilla costume was created from ready-mixed concrete, since commodities like rubber were in short supply after WWII. As a result, the actor was forced to wear a suit that weighed up to 100 kilos. Nakajima added that he was given little direction on how to portray the monster, and conducted his own research by studying animals in the Tokyo zoo. Nakajima took on the monster role in more than just Godzilla films, however. As the principal suit actor for Toho, he also played Mothra in 1961 and King Kong in 1967’s King Kong Escapes, among many other Japanese kaiju roles such as War of the Gargantuas and Frankenstein Conquers the World. In his later years, Nakajima attended Japanese monster conventions, including several across the United States, and wrote a Japanese language autobiography Monster Life: Haruo Nakajima, the Original Godzilla Actor, which was published in 2010. Godzilla has gone on to become a monster classic, with three Hollywood films, in addition to 29 original Toho films.